Why do you need a Magento SEO company for your Magento store? SEO is a very broad area of research. Each day something new comes up and we have to keep our sites updated with the new ‘something’. If we fail, other won’t, and they will be the ones in the top; not us. SEO is not a job of a one-man-army. Every site, every CMS and every eCommerce platform being used today possess its own properties and optimization scope. A single SEO strategy will never work for all of them. However, the basic concept of SEO remains same in all the cases; the difference is in the approach. Magento is one such platform sites on which need special approach and special skills to make it more and more SEO friendly. Though Magento is loved by the search engines, it’s not necessary that your version of Magento will be loved too. Therefore, you cannot just sit down and wait for the search engines to rank you on the top. We have to do your side of the SEO job and Magento will take care of its side by own. It is where you need a Magento SEO company by your side which has the expertise in handling the search engine optimization on Magento stores. How can a Magento SEO company come handy? A Magento SEO company possess a team of certified Magento developers who will make the SEO related changes to your website. The certified Magento developers analyze the site and diagnose it to find any technical or codes related error that may hinder the SEO. The role of developers is hardly mentioned in an SEO company profile but is is very important to note that a Magento SEO team would not be complete without a certified Magento developer in it. The developer from the Magento SEO company will handle all the coding related changes that will be desirable on SEO front. The development of AMP pages, making the new pages responsive, etc are some of the perfect examples of how important is the role of a developer in SEO services. Built-in SEO friendly features in Magento can do job if you know how to use them. I do not doubt the capabilities of the SEO experts, but an SEO expert having no experience with the Magento CMS system would not be able to do the job efficiently. He she might be able to handle all the tricky analysis, Keyword research, content planning, but handling the on-site SEO implementation can only be done if the SEO is familiar with the Magento system. For example, Magento possess loads of capabilities by default configuring which will do the half of the job. 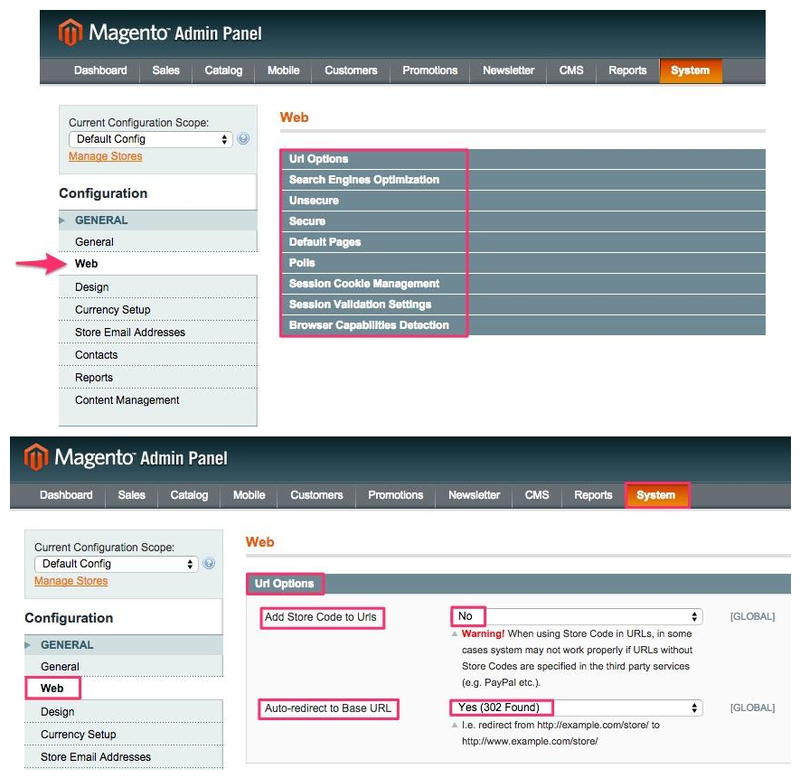 The screen-shots below show how a simple configuration can help if one knows these Magento configurations. These screen shots show how Magento can be real tricky for making the SEO friendly configurations if your SEO expert is not familiar with the platform. My point is, none of the expert SEO implementations will work if your Magento store is not even configured properly on SEO related features. This example is a glimpse of how SEO on Magento could be smooth like butter if a Magento SEO company or a Magento SEO expert works on it. A Magento SEO can either make or break your eCommerce site and business. Stuffing your content wit keywords in no longer a choice and not even enough. You need someone who can explore other options for your site. Options that can even be technical, non-technical, conventional and even non-conventional. It is not just the guidelines of the Search engines that you need to worry about in the case of a Magento platform but you also need someone who is an expert on using a Magento system. This is where you need a Magento SEO company because it’s not a one man’s job at all. You need a team.